It was a cold one last night! I don’t have congestion, but was having trouble breathing through my nose and was definitely snoring overnight. It was 30F/-1.1 in my room when I woke up. For the first time, I had condensation around the neck of my sleeping bag from breathing on it. I try to breathe into my buff I keep around my neck on cold nights, for warm air, but last night it just wasn’t working for me. It was actually warmer out in the sun than inside this morning, so we had breakfast outside. It was probably just 35F/1.7C, but we were quite happy to sit in the sun and eat. It’s all a matter of perspective I guess. The guys like the porridge with cinnamon and sugar, which is really affordable ($2 or less). I have trouble eating first thing in the morning, especially anything like porridge or oatmeal, so I have been trying egg and chapati (like a tortilla) but am often not hungry enough, so two hard-boiled eggs have worked sometimes. Other times, I just wait and have a bar I’m carrying later in the morning. This morning was a nice clear morning. It was brisk with a headwind, so layers stayed on most the morning, but it was sunny. We dropped 4,400ft/1341m over the 12mi/19.3km back down to Ghunsa today. It took us two half days to walk up that far since we were acclimating. Our mileage is a guesstimate using the mapping tools we have and the apps we are using. The guidebook gives times and not distances. It was pretty straightforward to the midpoint at Khambachen. Griggs is still super depleted, especially on uphill bits, so we agreed to just meet in Ghunsa. He thought he’d like lunch in Khambachen, and Buck-30 and I figured we’d just snack until we got to Ghunsa. Khambachen is where I thought I left my diamond necklace I tend to lose or break every year. Unfortunately, they didn’t have it. I even looked in the room in detail. It totally could have fallen through the cracks of the floorboards. Ugh! I swear, I’m an idiot! We sat for a bit and got water before heading on down to Ghunsa. 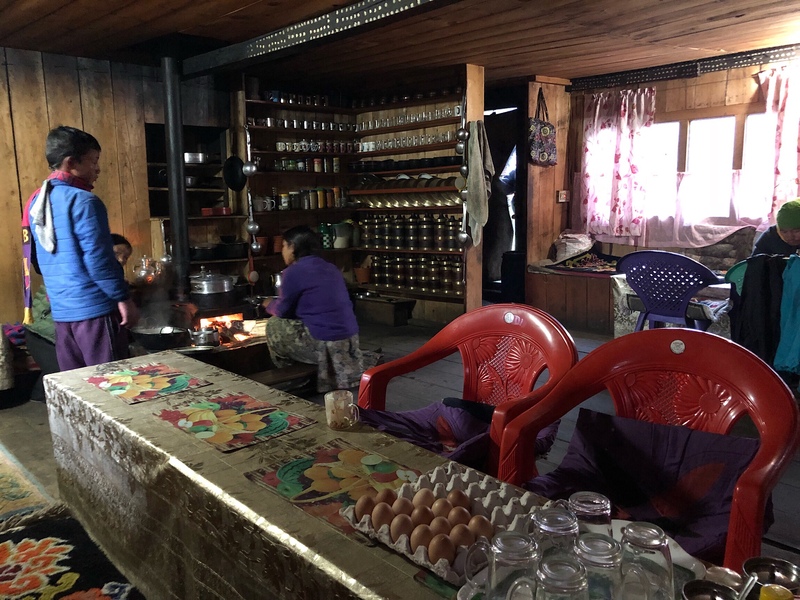 This is where Kishor had tried to get us to stay at another teahouse, so he split from us once we hit the village and wasn’t responding when we yelled over to let him know we were leaving. We told the people nearby to let him know we left and we knew he’d easily catch up. As we left the village, Buck-30 started following a more defined path with large posts. We passed under an archway of prayer flags I didn’t recall, so we backtracked. 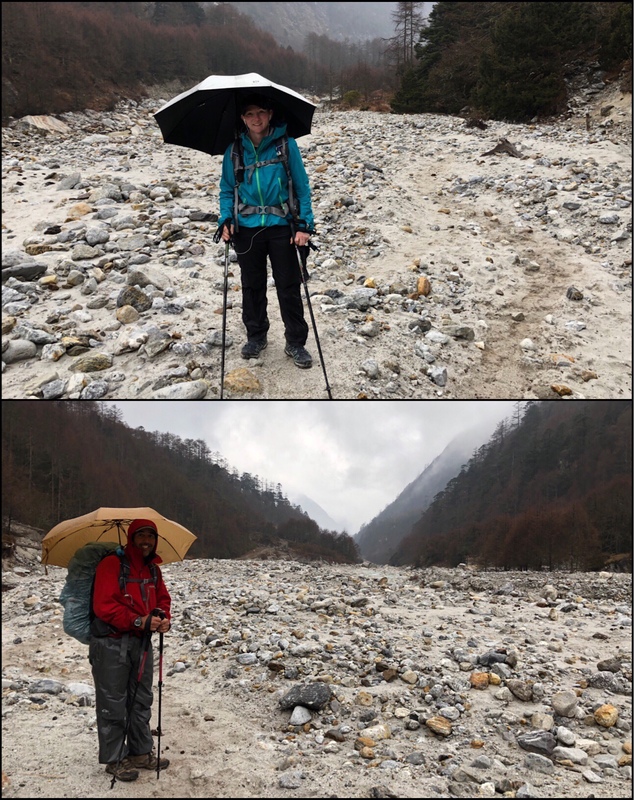 Somehow we needed to get down to the riverbed to cross the river, but nothing was looking familiar to what we did a few days ago. We backtracked and ran into Kishor, who helped us out. 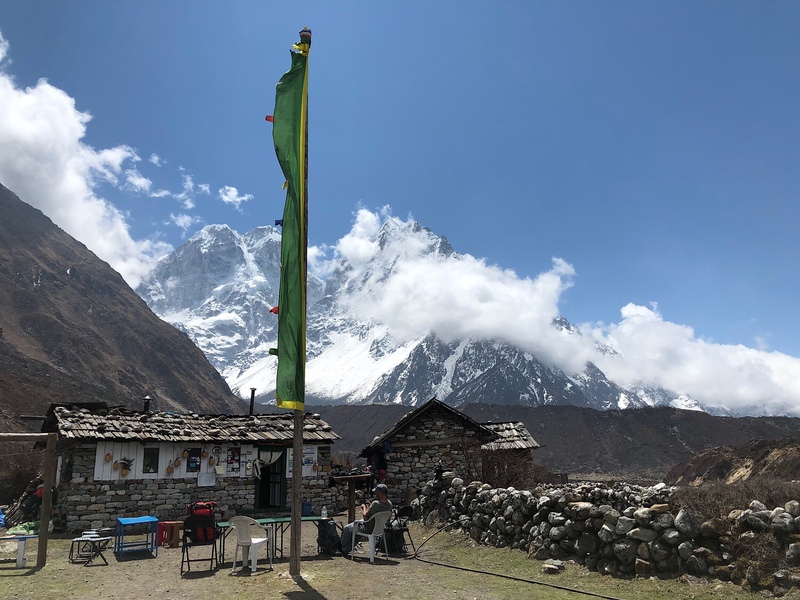 We had passed those prayer flags the other day, but from another angle, so it looked completely different. Instead of the obvious well marked trail, we found a fainter one that wound downhill and around the corner to the obscured bridge. In the midst of all this, Kishor spotted Griggs hiking through the village opting not to have lunch. We decided to wait about 10mins for him so he didn’t have the same confusion. Good thing we did. He was also disoriented by the junction and we called him over our way to find out his phone’s GPS was randomly not working at all today. These last few days have been quite unfortunate for Griggs, but this is why we have a team. It will happen to all of us at some point. Once we got through that, we all spread out again now knowing where we were. It was 6mi/9.7km to Ghunsa. 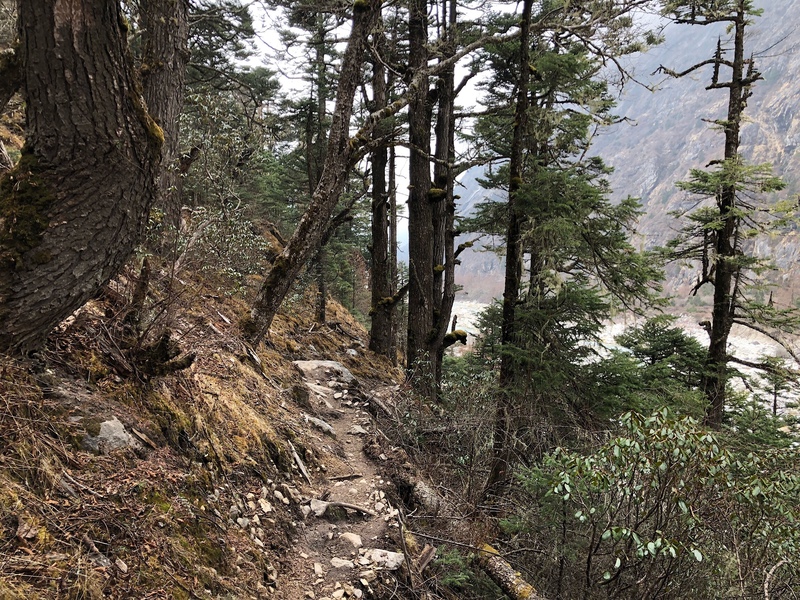 It was tough to recall, but it is for sure an undulating trail between Khambachen and Ghunsa. It was not the downhill cruise we hoped for. 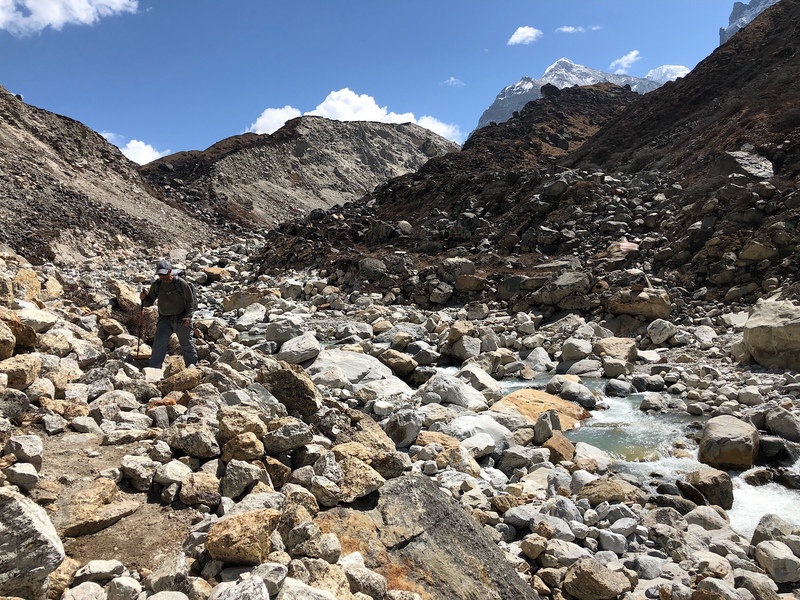 As we hiked, we hit a lot of guided groups with porters and porters seeming to be delivering things to the village. It really is incredible what they carry! 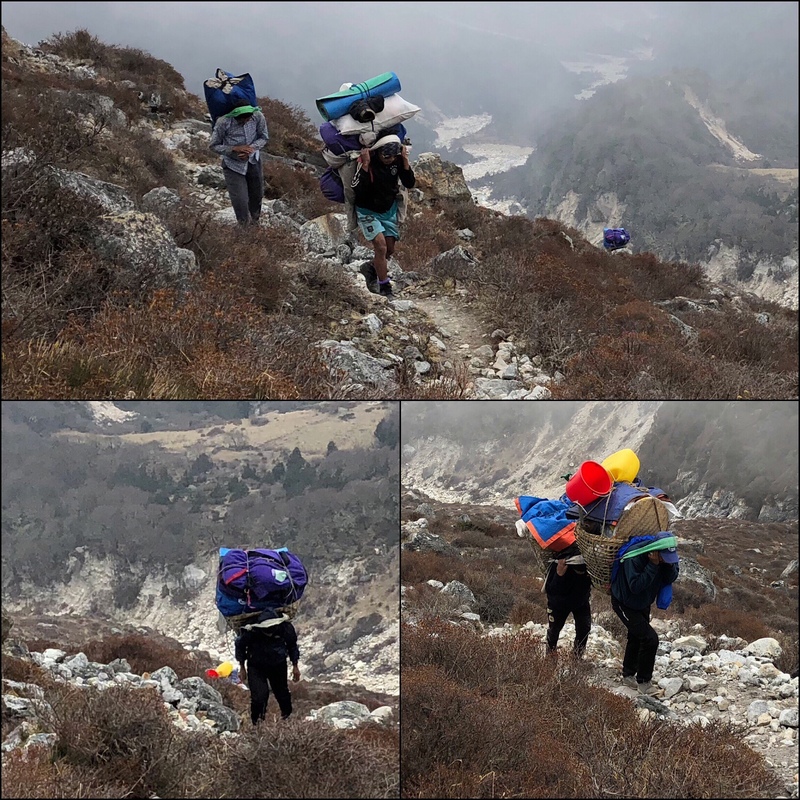 I still can’t adjust to seeing people with daypacks surrounded by porters carrying insanely large loads all around them. 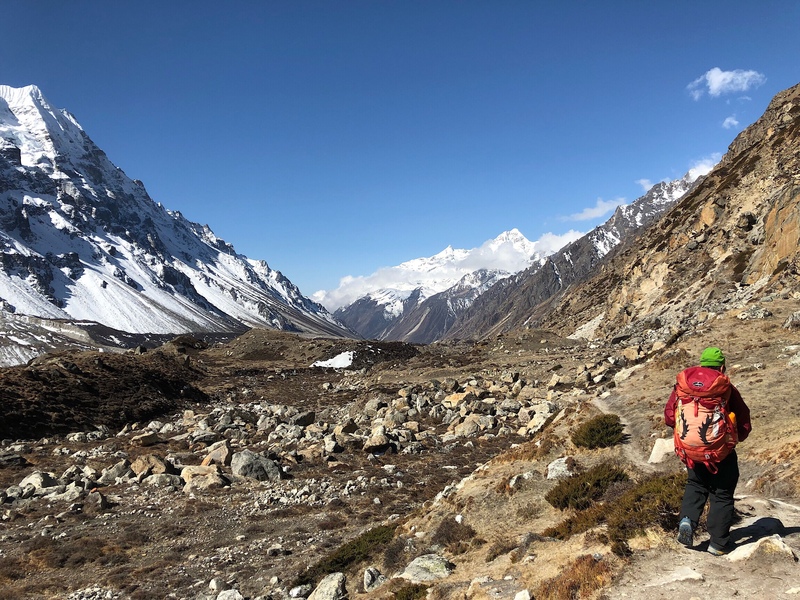 I know not everyone can carry their own gear up here, and it provides jobs for the Nepalese people, but it’s just a different perspective when what I’m so accustomed to is thru-hiking. I was just behind Buck-30 and Kishor when we dropped below tree line. I stopped to take my buff off and pee. Then I continued down and took off my gloves and reached up to take off my beanie. It wasn’t there! Ugh! I knew exactly what I did. When I pulled my buff over my head, I must have also pulled off my beanie without even realizing it. I put my pack down and hiked back uphill a few minutes. Yep, it was right where I thought it was, and I got to it just as Griggs was coming down the trail too. Good to check in with him before setting off again. I really need to focus more and never do! An hour later, I came upon Buck-30 and Kishor taking a break. We waited a bit for Griggs, but it started raining, so we headed on with still a couple hours left. The rain came down hard enough that we got all our rain gear on and used our umbrellas. Good to get back in the swing of doing that. 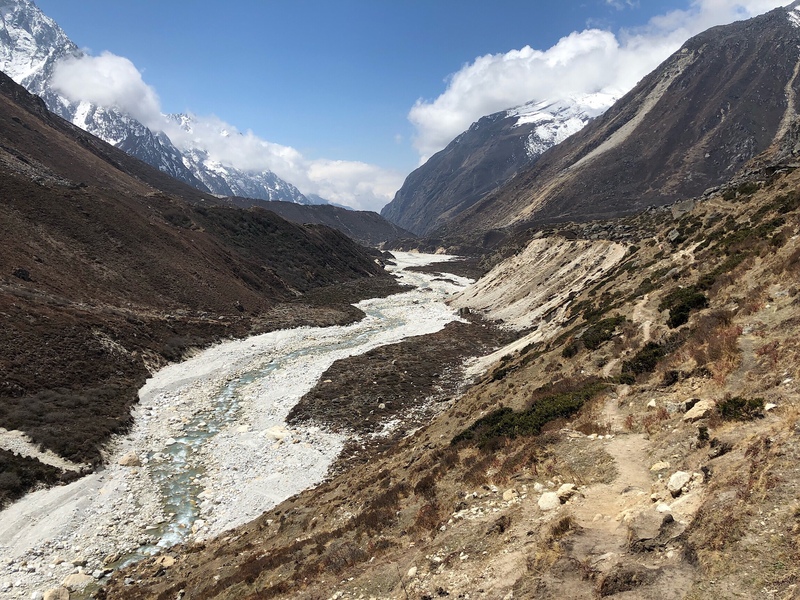 It is true that at this time of year, in Eastern Nepal at least, it tends to be clear in mornings and then clouds come in by early afternoon, and there’s a daily chance of precipitation. 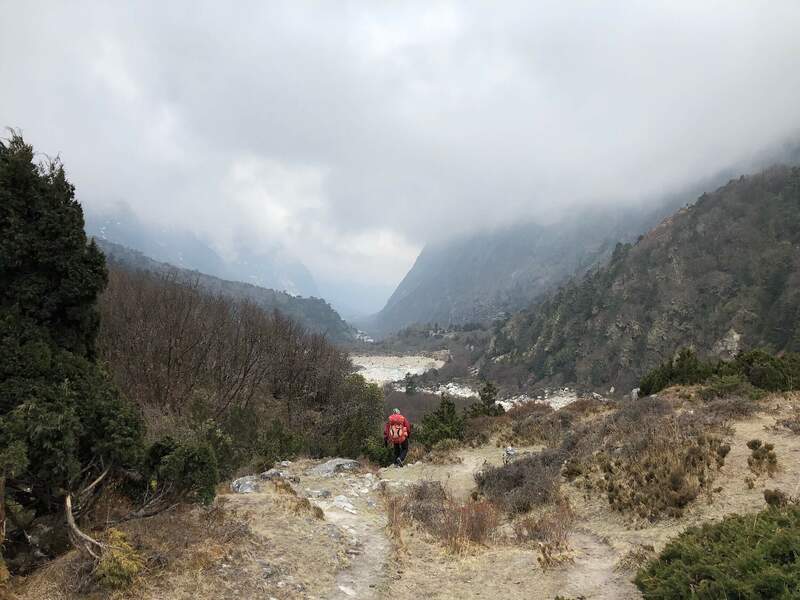 In fact, each day we’ve hiked, it has rained or snowed in the afternoon or overnight. We made it into Ghunsa just before 3pm, and returned to the Selele Guest House. It was nice to return to something familiar. Somehow, every night except one, we’ve had teahouses all to ourselves. It’s been very nice to get that kind of space and quiet. The family that runs this place is very kind. The woman who cooks does an amazing job, and it is like watching a skilled artist or something. We told her how we had mo mos and veggie fried rice the last few days since leaving her place, and that her cooking as been the best. We also realize that it could also be that they are lower down in elevation where supplies and ingredients are more accessible. Having now been to the further reaches, well away from any sort of road access, we can now better appreciate what they have here. Also, I remember being cold the last time I was here. Not tonight. It was below freezing in my room the last two nights. Now, down at 11,218ft/3419m, it’s 48F/9C in my room, and I’m so much more comfortable! Again, it’s a matter of perspective. Tomorrow we have quite the climb up and over Nango La Pass. Griggs has finally decided to start taking cipro tonight just in case that’s the problem. He’s had a solid four days of really being completely worn out. Mainly on climbs. Tomorrow, we get our 15lb/6.8kg food bags back in our packs for what looks to be a 4,500ft/1,372m climb over less than 4mi/6.4km. Since Griggs doesn’t have a working GPS and we have no idea how his body will react to such a climb at high altitude, we’ve decided to stick together tomorrow and go his pace. We are starting plenty early to give us more than enough time to get over the pass before the afternoon clouds move in hopefully. It’s going to be a very tough climb for all of us! While some of your luck was bad, you also had some perfect circumstances to get back on track! Hopefully that will apply to your necklace too. So sorry about your necklace. I will hope it shows up, deep inside your pack. The beanie would be a big loss; glad you could recover it so quickly. I love the way you are supporting Griggs and am sorry he is so affectex. Is the necklace the first loss of the trip?! Hopefully the last one too. First loss was technically dental floss right when we started. Went three weeks without it and that drove me nuts! But yes, much better this to around quantity wise in losing things. Out here, just no way of replacing them. Oh! And the trowel! Three things, haha! I admire your incredible stamina and endurance. and you’re just getting started! I would also be conflicted about someone else carrying my gear and setting up my tent. I truly enjoy all your posts and photos. I have many questions to ask you about Nepal. Feel free to reach out to me if/when you want to look into this hike more, but I can’t recommend it to most. There is a lot of vague information out there and most have no idea what they would be signing up for. 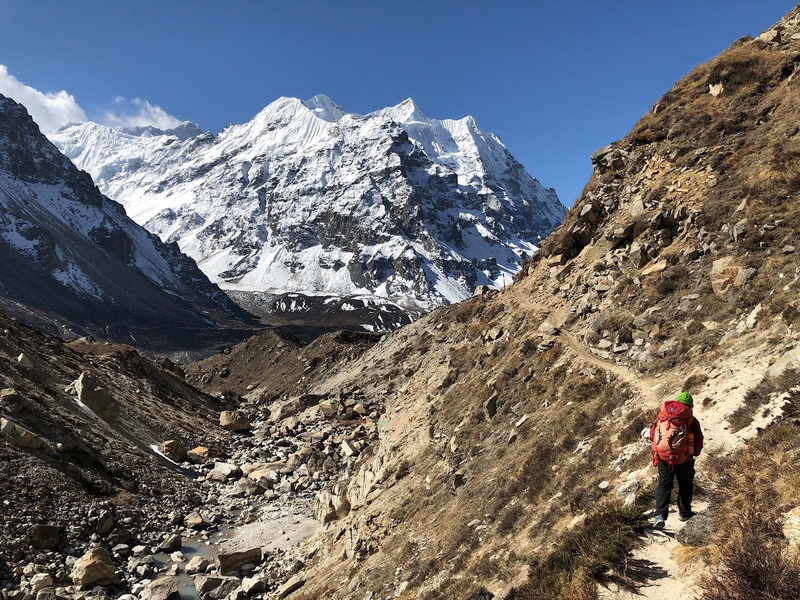 We knew, decided to give it a shot, and just decided there were much more enjoyable ways to spend days or even to see Nepal. Again, feel free to email me for specifics, but I recommend looking at my experience in detail first to know fully what this entails just in the first month.